Songlines is an enchanting story set in regional Victoria which leads to Eden - a hidden secret world. Songlines is very much steeped in Aboriginal heritage which unfolds as the reader meets leading character Laine, a young girl who lives on a sheep property with her Aunt. Laine has a secret, but she doesn’t even learn the true nature of her biblical heritage until a mining company threatens her family land. Before long it is revealed Laine is a Cherub, a person with special powers, charged to guard the gate to Eden. Laine must battle with her soul-mate - Bane - by her side, who she has spent much of her life despising to protect the gateway to Eden. Twists and turns keep the reader interested, including learning that Laine’s mother is alive, and Noah’s mother isn’t what she appears to be. Songlines, set in an everyday Australian background, is not only relatable to the reader, but it utilises engaging central characters in Laine, Noah and Bane. It is very much a quest for discovery and truth about Laine’s heritage as well as a struggle to stop a large company conquering a piece of Australia. The story line flows very cleanly and is engaging enough to keep the reader wanting more. This innovative and book will best suit young adults as they are sure to relate to the characters and the feelings evoked throughout the story. 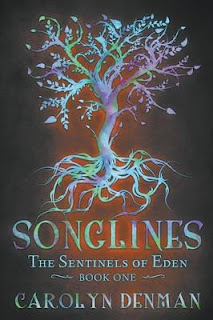 Songlines left me wanting more: has Laine made the ultimate sacrifice to save Eden?